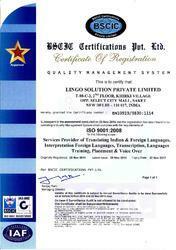 Established in the year 2010, we, Lingo Solution Pvt Ltd is the fastest growing Service Provider firm exploring innovation in global communication by offering best in Language Interpretation Services, Italian Translation Services, Spanish Translation Services, Japanese Translation Services, French Translation Services, Korean Translation Services, Audio Transcription Services, Medical Transcription Services etc. 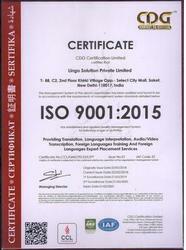 We have gained the reputed ISO 9001:2008 certification for offering a broad range of services, which includes widely demanded Language Translation Services, Transcription Services, and Language Interpretation Services. The talent and expertise of team members are widely acclaimed and we have become a partner of choice for the offered timely commitments, remarkable accuracy, strict quality supervision and competitive price. We have built a close relationship with a huge client base from varied industrial terrains. 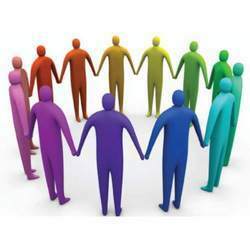 And we take pride that our team is well aware of the technical know-how of different sectors including telecommunications, electronics, IT, mechanical, petroleum, chemical engineering, medical treatment, environment, energy sources, medication, shipping, textile, aviation, psychology, finance, economy, management, and education. The secret behind our rapid stride is our mission to explore innovative ideas to process the multilingual communication. Further, our endeavors to become the pioneering name in the translation industry are further strengthened by leading transcription and interpretation technology along with positive client feedbacks. Few names that showed trust in us are Carrier Air conditioner, Gurgaon, and Hindustan Unilever Limited, all over India. Mr. Prabhat Kumar is the guiding force that inspires us to achieve higher milestones. His rich persona inspires us to bridge the communication gap by rendering paramount customer experience. Services of Translation and Transcription. Since our modest beginnings, we follow a multifaceted approach to attain highest levels of customer satisfaction. Our multilingual translators are specially trained to fulfill the pledge of speed, cost and quality, which fosters our vision to render superior customer experience. Being a client centric firm, we respect the clients’ anticipation for privacy and agree to sign the Non-Disclosure Agreement (NDA). Our day to day operations are driven by the principles of honesty and uprightness. And, we strive to fulfill the pledge of transparency by adhering to the rigid norms defined in our quality policy. We make sure to surpass the competition by recruiting trained multilingual experts and technologically adept professionals. In addition to this, a team of highly skilled quality controllers supervise each activity of our translators. To use a multifaceted approach in giving the paramount experience to our clients in terms of quality, speed and cost. To constantly work upon rendering our services to match client’s thoughts. With our innovative ideas, we will steadfastly advance to become the most prominent name in the translation industry. We posses vast experience in the Translation Industry and offer reliable solutions to our clients. With the support of our experts, we meet the specific requirements of clients in a best possible manner. Furthermore, we have modernized technology and educated transcription specialists who helps us in offering reliable services to our clients within a given timeline. Before taking the client's assignment, we stringently analyze their requirement and demand and offer services accordingly. Moreover, owing to the features of our organization, we deal with both national and international clients. Our team is motivated towards the pursuit of excellence and owing to their diligence we have gained a leading repute in such a short span of time. We have recruited talented individuals who strive to excel at every stage. Our team comprises of experts that are well versed in multiple languages and backed with requisite certification. We have technologically adept language specialists in our team who are well aware of the grammar semantics and specially trained for audio and video transcription. We believe that efficient communication is the key to success, and to let our clients achieve their business goals we provide efficient and innovative services. We have gained a wealth of experience in national and international languages and the industrial expertise of our team members reflects in our huge client base. Further, we adhere to the ethical business policies that constantly enlarge our commercial footprints.